With your Free Trial, you’ll be automatically enrolled in the Aviva monthly service. You have 14 days following your order to cancel your vip membership for any reason. Don’t worry—we’ll remind you. If you choose to not pause or cancel, you’ll be charged $49.95/month for the 1 Month/ 30 Day supply of Aviva Advanced Nutrition. 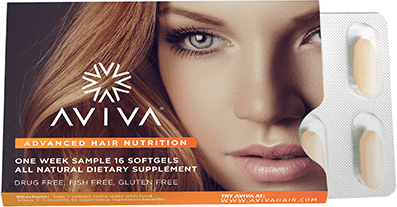 It includes 8 blister packs and 64 soft gels or $39.95/month for the 1 Month/30 Day supply of Aviva Hair Revitalizer, depending on which one you sampled. Shipping will always be free on your monthly orders. We guarantee your complete satisfaction.